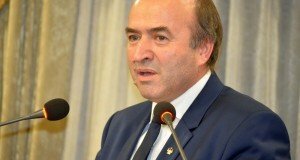 Several people have thrown eggs at the Justice Ministry’s building on Monday morning, in an attempt to protest against the Justice Minister Tudorel Toader who is accused of promoting the emergency ordinance-GEO 7 that amended the justice laws in favour of the corrupt dignitaries. 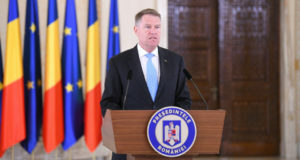 The protesters, including Cristian Dide and Marian Morosanu (whose nickname is Ceausescu), have thrown eggs at the Justice Ministry’s headquarters, according to local mass media. 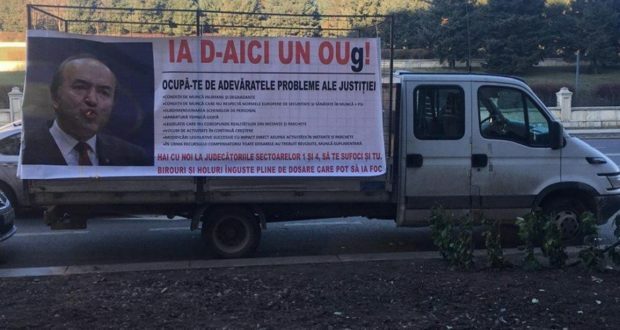 Protesters have also brought two dummies featuring Tudorel Toader and Calin Popescu Tariceanu (chairman of ALDE, the party that is endorsing Toader in the Government). The eggs have been thrown out of a van displaying a banner with the face of Justice Minister Toader and with anti-GEO 7 messages. The gendarmes who were securing the area in front of the ministry had no time to react and prevent the throwing-egg protest, as the van was equipped with an iron cage from which the protesters threw the eggs. 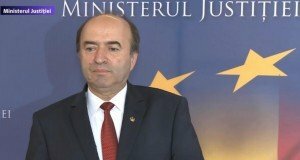 Last Thursday, the same protesters threw mustard and ketchup to a car of the Justice Ministry parked in front of the ministry, while a similar protest took place last month after a young man had been killed by a recidivist who had been released from prison before time, based on the compensatory appeal, also promoted by the Justice Minister. Back in January, protesters brought red paint and knives to send their message.